BVP CET Exam Details 2018 – Syllabus Pdf, Exam Pattern, Preparation Tips, Model Papers, Cut off, etc. About BVP CET Exam: Bharati Vidyapeeth Common Entrance Test is a university level examination will be conducted by Bharati Vidyapeeth University every year. Through the entrance test, the candidates will get admission in various UG and PG courses offered by BVP and its affiliated institutions. BVP CET 2018 will be conducted by Bharati Vidyapeeth University. If you want any more details About BVP CET Exam please scroll down the page and get complete info. 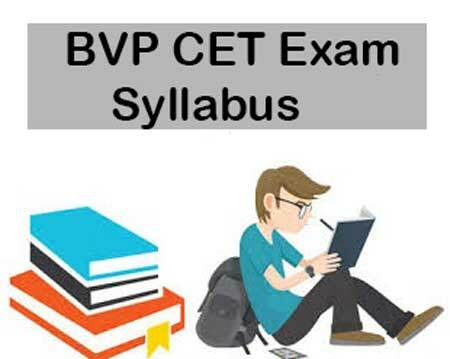 BVP CET 2018 syllabus will be different for all the courses. For engineering the syllabus comprises of Physics, Chemistry and Mathematics/Biology of 12th standard. For BVP CET Medical, the syllabus will be consisting of the syllabus of Intermediate standard. About BVP CET Exam Pattern 2018 is given below. This entrance exam will be conducted through offline mode. The question paper will be total three hours and the duration of MCA/MBA exam will be two and half hours. There are total two hundred questions. The question paper will consists of objective type questions and this question paper will be provided in English language. Each question will be awarded with one marks and there is no negative marking. The time is the best source of excelling in the exam, the candidates are advised to utilize the time properly for each subject. To score well in the examination, candidates have to follow the best books and study materials. Candidates are advised to practice all previous year question papers. Model papers and sample practice papers of BVP CET will help you to know about the right format of the examination. You can score better exam by going through model papers. By practicing the previous year model papers you can manage your time in the exam and you will see improvement in your exam preparation. The Cut-Off marks of BVP CET 2018 will be released by Bharti Vidya Peeth University, which is the exam conduction authority. The cut off marks will be based on the certain factors such as number of students who gave this exam, Previous Year cut off marks and the difficulty level of exam etc. Note: BVP CET Entrance Exam 2018 Dates not fixed, the exam dates are different for different types of courses. The Admit Card is the entry card for all the applicants in the examination hall. The BVP CET 2018 Admit Card will be provided by the official site. The authorized University will issue the admit card to all the eligible candidates. You can follow the given below steps for downloading the BVP CET 2018 Admit card. Step 1: Go to the official site by clicking the given link www.bvuniversity.edu.in. Step 2: Candidates can find the link for downloading the online admit card. Step 3: Then they should on the link and enter the necessary details for downloading admit card in the given space. Step 4: Now they should click on the submit button. Step 5: Candidates can download the admit card and take a printout of it.